Most people are aware of a certain fast food restaurant with the word “bell” in it that serves food like burritos and more Tex-Mex cuisine. 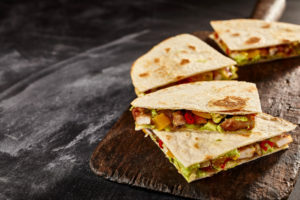 For those that are big fans of its quesadillas, this recipe will show you how to make some that are practically identical. To make the sauce, use a medium bowl to whisk the cayenne, mayo, paprika, jalapeño juice, cumin, minced jalapeños, and the garlic powder. Put that aside temporarily, grab another medium bowl and add the chicken. Toss it with half of the quesadilla sauce and them put it aside to use as dip. Grab a large skillet, turn up the heat to medium-high, and add a flour tortilla. Top with a pair of slices of the cheddar or American cheese and half a cup of chicken, then use a half cup sprinkling of Monterey Jack cheese. Place a second tortilla on top of the first one and cook until the bottom tortilla turns golden, it should take about two minutes or so. Flip the tortillas over, repeat the process for the second tortilla, and make sure the cheese has melted. Continue to cook the rest of the tortillas so that you end up with a total of three quesadillas. Slice them into wedges and serve them warm with whatever sauce is left.